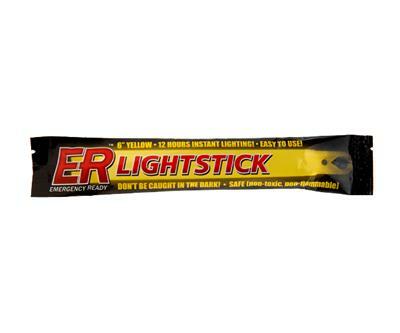 ER™ Emergency Ready Yellow Lighsticks illuminate for up to 12 hours. Each lightstick provides a safe, bright and reliable emergency light source. Lightsticks are non-toxic, waterproof and versatile. Effective for emergency situations, yet safe enough to use recreationally by children and adults. Dimensions: 1 lightstick: 1" x .5" x 7.5"
ER™ Emergency Ready Yellow Lighsticks illuminate for up to 12 hours. Each lightstick provides a safe, bright and reliable emergency light source. Lightsticks are non-toxic, waterproof and versatile. Effective for emergency situations, yet safe enough to use recreationally by children and adults. Up to a 2 year shelf-life.